Greece is surrounded by the Mediterranean Sea and it owns no less than 2,500 islands, 165 of which are inhabited. Crete is the biggest of them all and it has the most amazing beaches you can imagine. The island is rich in history and it was there that the earliest recorded civilization in Europe, the Minoan, was born and flourished between 2700 BC and 1420 BC. Crete is an important part of Greece’s economic and cultural life and it is in the southern part of the Aegean Sea. The island is mountainous and a high mountain range crosses it from east to west. Its rocky surface has carved the character of the people living there. During World War II, the island played a major role in the resistance and it was there that the famous Battle of Crete took place in May 1941. Crete has a local kitchen that diverges from all the other local kitchens in Greece. Cretan diet is considered to be one of the healthiest, most nutritious and comprehensive ones recommended by doctors and dietitians around the world. The principal aspects of this diet include proportionally high consumption of olive oil, legumes, unrefined cereals, fruits, and vegetables, moderate to high consumption of fish, moderate consumption of dairy products (mostly as cheese and yogurt), moderate wine consumption, and low consumption of meat and meat products according to Wikipedia. I believe the epitome of Cretan diet is Cretan Dacos. It is an absolutely perfect dish in its simplicity and combines main and important elements for a healthy and nutritious meal. The original one is made with xinomizithra an unpasteurized Greek cheese, a sour variant of mizithra. It is made from ewes’ and/or goats’ whey with the addition of milk. The cheese is soft, white, creamy and granular. In most cases, feta cheese is a substitute of xinomizithra and this is how the rest of Greece eats Cretan Dakos. Do try it and you will realize that simple as it may look and sound, it is absolutely delicious and addictive. You put the kritharokouloura under the tub and bath it for a few seconds (count to 10) to make it softer. In a pot with boiling water, sink the tomato and let it boil for 1 minute. Remove, peel it and dice it. Put the kritharokouloura on a dish and add 3 tbsp of olive oil. Add the diced tomato, the salt and above it add the crumbled feta cheese. Pour the remaining 3 tbsp of olive oil and season with the oregano. It is ready to be consumed. Trust me on this it looks simple but once you start eating you simply cannot stop. The proportions are only indicative you can add or subtract according to your liking. ‘Ολοι γνωρίζουμε και αγαπάμε αυτό το πιάτο της Κρητικής κουζίνας! Το έχουμε κάνει και μεις δικό μας! Βάζετε την κριθαροκουλούρα κάτω από τη βρύση για λίγα δευτερόλεπτα ώστε να μαλακώσει. Σε μια κατσαρόλα με βραστό νερό, βυθίστε την ντομάτα και αφήστε να βράσει για 1 λεπτό. Αφαιρέστε τη φλούδα και κόψτε τη σε κύβους. Βάλτε την κριθαροκουλούρα σε ένα πιάτο και προσθέστε 3 κουταλιές της σούπας ελαιόλαδο. Προσθέστε τους κύβους ντομάτας, το αλάτι και πάνω από αυτά προσθέστε την τριμμένη φέτα. Ρίξτε τις υπόλοιπες 3 κουταλιές της σούπας ελαιόλαδο και τη ρίγανη. These look delicious. I love how they are so simple to make. Thanks so much for sharing them during Our Little Family Adventure’s Community Party on Facebook. Yum, this looks delicious! I love simple and am always up for trying new kinds of foods. Pinned! This looks so yummy and unique! Thanks so much for linking up at Homemade Ginger! I had no idea that Greece had so many islands. I love coming here and learning about your country. It’s like getting a personal inside view. Thank you! And thank you for these Cretan Dokas! With all of the fresh tomatoes hitting the markets right now, this looks like a perfect way to enjoy them. Thanks! Oh My! I am pretty speechless and pretty hungry now. This is a stunning photo of a great dish. 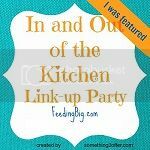 Thank you for posting this recipe at the In and Out of the Kitchen LInk Party. I am featuring this recipe at the Top 10 Favorites post that will go live on Monday morning. Thanks again! Yum!! Pinned it! Thanks for sharing this with us at One Sharendipity Place this weekend!! Me encantaria probar se ve muy tentador y deliciosos,abrazos. What a wonderful recipe and post! Thank you so much for joining us and sharing this at Best of the Weekend! Pinning to our party board. Have a wonderful week and please join us again next Friday! Yum. What a lovely recipe. It would make the perfect light lunch or dinner. I love feta with tomatoes together. This sounds wonderful and a perfect dish for those hot evenings. Thanks for sharing on Foodie Friends Friday and I hope you join us this coming week. It is so hot here in NY I could eat your lovely salad for dinner… if I could only motivate myself to go to the store. Thanks so much for sharing this recipe with us on foodie friday. The bread looks so delicious. What a gorgeous looking dish. Thank you for sharing at our Pinteresting Party! Αυτό είναι το μεγαλείο της απλότητας!! Άντε να πάμε διακοπές στην Κρήτη να φάμε ντόπιο ντάκο! what an informative post, katerina–thank you! i really like the sound of this, as i find tomatoes and feta to be a killer combination! Katerina, I’m delighted to discover such a luscious looking, but completely unknown dish! Actually I think my half-Greek friend told me about it once… he was very enthusiastic but said it’s impossible to get the deliciousness of the special cheese and the local bread here… I will however try to prepare it anyway (I do have Greek oil brought by my friend and made by his family; I save it for special use only…). mmm feta!! this looks so savory. I also like your new blog colors! Hmmm I don’t know if we have any kind of rusk here…but maybe it’s just called something else? Either way, sounds like a tasty meal! It looks light and delicious – very summery recipe! My mom peel the tomato the same way. It’s packed with Greek flavors and looks delicious! So simple and packed with flavor…love it! I studied abroad in Athens 7 years ago, and miss Greek food so much! This looks so simple but so delicious! I can’t wait to try it out, thanks for sharing! Healthy appetizer, simple & easy to make with few ingredients! Thank you Katerina for sharing traditional Greek recipes! Lunches like this are right up my alley, Katerina. The barley rusk is new to me, but I can think of several substitutes. I’ll never forget my visit to Crete…I had a temperature of 102! But I toured anyway! I alwyas liked to get it as a starter in restaurants! I want to visit Crete so badly! This is lovely. Thanks for sharing at Simple Supper Tuesday. This looks like a perfect lunch for me. I’m hungry just looking at it! I have been to Crete, beautiful island and great food. This dish is a perfect flavor of the place. Look absolutely tempting and delicious! I love visiting your blog no just for all the delicious food you make but also you introduce me to so many new things. I would love to try this out. 3. Ξυσμένη ντομάτα στον τρίφτη. Με αυτόν τον τρόπο τα υγρά της ντομάτας ποτίζουν το παξιμάδι, γι’ αυτό και δε χρειάζεται πολύ μούλιασμα. Και όταν λέμε ντομάτα, εννοούμε μπόλικη, καλοκαίρι έχουμε! Και το χειμώνα που οι ντομάτες είναι χάλια, δοκίμασε να βάλεις λιαστές και λίγο μπαλσάμικο – δεν παίζεται! Cretan Dacos are completely new to me. I like the simplicity of this recipe, and I am sure it tastes wonderful too. It so simple to prepare yet it looks superb! I will try it with a nacional cheese. Lovely post. Crete is one of the places I most want to visit. Thanks for taking me there! Η τέλεια καλοκαιρινή σαλάτα και τρώγεται και για κυρίως γεύμα!!! Η αγαπημένη μου σαλάτα και ένα από τα πολύ αγαπημένα μου γεύματα! Το τρώω χειμώνα-καλοκαίρι και όταν έχω ξινομυζήθρα ακόμα καλύτερα! Βαγγελιώ μου θα συμφωνήσω απόλυτα μαζί σου και γι’αυτό και στο αγγλικό κείμενο το αναφέρω ρητά. Επειδή όμως η ξινομυζήθρα δεν βρίσκεται εύκολα στο εξωτερικό δίνω την εναλλακτική της φέτας που είναι πιο εύκολα προσβάσιμο τυρί. Thanks for the sharing of traditional recipes! Great for the summer diner with glass of wine!